Each year, thousands of unwanted kittens and puppies end up in shelters because people cannot afford to spay or neuter their pets. Although Hopalong & Second Chance Animal Rescue is able to help hundreds of these animals each year avoid uncertain fates in the shelter system, we still have dreams of doing more. 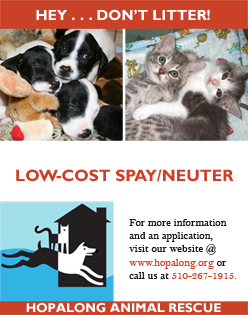 Hopalong Animal Rescue now offers pet owners with genuine financial need the opportunity to have their pet spayed or neutered for free or at low cost, depending on their household income. 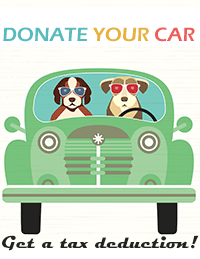 Our cost to spay or neuter is cats $60*, Dogs $100*. Low-income pet owners pay a portion of those costs depending on their household income. Cats must be at least three months old and weigh four pounds. Dogs must be at least four months old and weigh five pounds. Owners schedule the surgery with our partner veterinary clinic in Fremont and must be able to transport their pet to and from the clinic. Other services may be offered to you at the time of surgery. If you choose to get these they are your responsibility to pay for at the time of service. If you have questions about our program or if you would like to apply to receive assistance, you can fill out an application on-line or download an application to fill out and mail to us. Once we receive your application, it will take about a week for us to process the voucher. Please be prepared to show proof of income in the form of a pay-stub or unemployment stub.